University of Karachi is the oldest and largest public sector university of Sindh province while it is located in Karachi. The university was established soon after the independence. Most of the colleges in Karachi and its adjacent areas are affiliated with Karachi University from bachelor to PhD level. Karachi University provides different types of education including arts, science, law, commerce etc. Every year, thousands of students appear in various levels of exams under KU. Apart from regular students of KU and its affiliated colleges, many private students register themselves and participate in the exams of BA and MA classes for various subjects. The exams of all the classes from BA/ BSC to PhD level are held according to a regular schedule. After few months of the exams, the results are announced by Karachi University. The concerned students can view their detailed results at the official site of KU soon after the declaration of results. The result cards are issued also at the same time while the students can receive their result cards two or three days after the results. The result cards of regular and private students are mailed to their related institutes and home addresses respectively. The supplementary exams of different classes are held few months after the result announcement of annual exams for failed students. The results of supply exams are issued by KU couple of months after the exams. 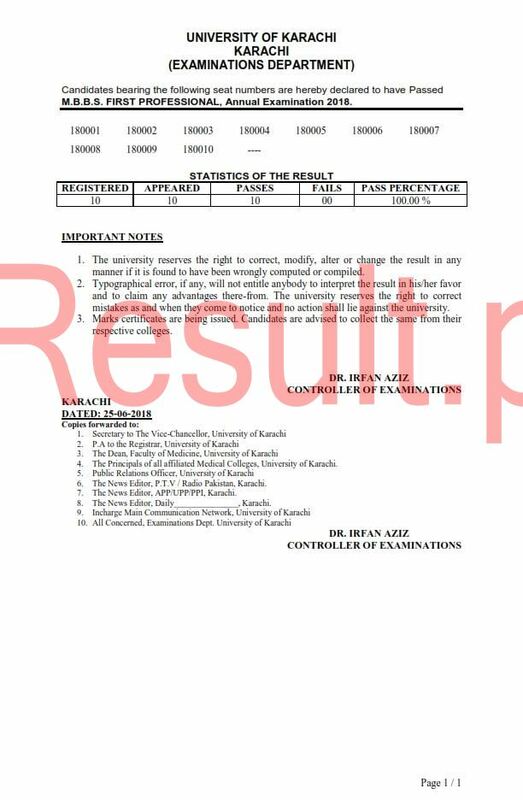 These supply exams’ results are also uploaded at the official site of Karachi University soon after the announcement of result by the university.